Tech companies are generally known for their exponential growth potential. With great potential comes great volatility. However, “old techs” show strong core businesses and significant cash flows. Here’s the tech dividend stocks list. Facebook (FB), Amazon (AMZN), Netflix (NFLX) and Alphabet (GOOG) form what we call the FANG stocks on the stock market. Those tech stocks don’t pay dividends, and they are rapidly growing. This is usually the image we have of tech stocks; young kids in their garage achieving their billionaire status before they turn 30. No so much for income seeking investors, though. There is now a whole universe of “old techs” that have built a solid core business and have now agreed to share their bank account with their shareholders. Several well-known companies such as Analog Devices (ADI), Intel (INTC) and Microsoft (MSFT) have been paying dividends for over a decade. They show the perfect balance between growth potential and a solid core business enabling dividend payments. This article explores this sector, defines how it can boost the yields in your portfolio, and provides you with a complete dividend stock lists including comprehensive metrics. #1 Companies with disruptive technology entering various fields such as retail (Amazon), Television (Netflix), Financials (Robinhood) or accommodation (Airbnb). Those companies are fighting for market share and they are rapidly growing. They are not interested in paying dividends. #2 Companies that were once growing rapidly through technology breakthroughs, but have grown-up. Those are “adult” tech stocks that are well established in their respective markets. Since it’s in their DNA to develop new technology, they are still manifesting several growth vectors. At Dividend Stocks Rock, we are interested in the later. Older tech stocks have developed new markets that are relatively mature now. We can think of Microsoft and Intel that were at the very beginning of the PC era. Now that consumers are shifting toward smartphones and tablets, PC sales are slowing down. However, both companies still enjoy strong cash flow generation from their PC related activities. At the same time, they have also developed other technology (cloud, big data, data center, etc.) that enables them to post high-single digit to double-digit revenue growth. The number of techs now paying dividends for at least 5 years is rapidly growing, and there are enough companies to make a full list now. What Tech Stocks Can Do For Dividend Investors? It is usually rare to find tech stocks with a high yield. If you are looking for tech stock with a 6% yield, you will not find them on our list. We use this sector to boost our portfolio value appreciation while supporting a minimum level of income. The list contains mostly companies showing a 1.50% to 3% dividend with a few exceptions over those levels. 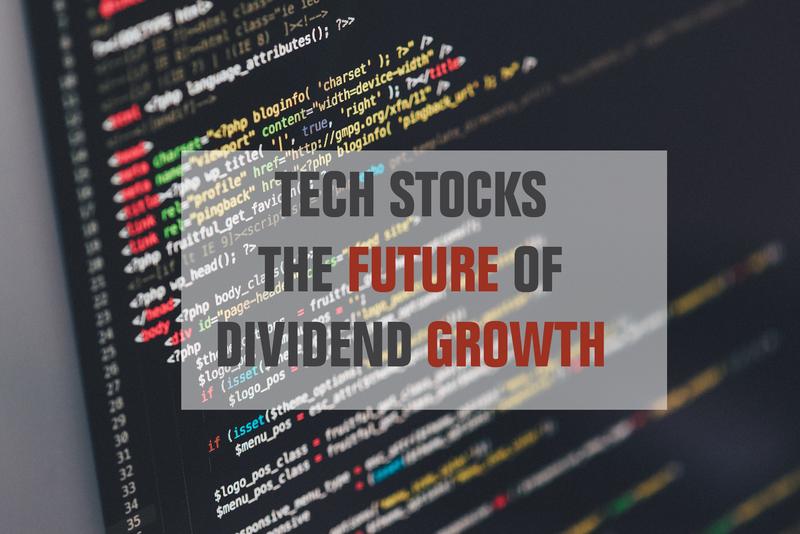 What is more interesting about tech stocks is their dividend growth potential. While yield is low, you will find many double-digit dividend growers. Therefore, you can expect your dividends to grow rapidly. Tech dividend stocks are for investors looking for both stock appreciation and strong dividend growth. The Tech Dividend Stocks list is being updated on a quarterly basis. The risk with tech stocks is to fall for the proverbial “false hope”. Hope that a new technology breakthrough will happen and save the business. Hope that the stock price will skyrocket upon the next quarter. Hope that you will find the next Microsoft or Apple (AAPL). The second risk with tech stock is obviously the speed at which technology evolves over time. You never know if you are holding the next BlackBerry (BB) or the next Apple in your portfolio. This is why it is important to select companies that have a well-established growing business model and they multiply that growth through other avenues at the same time. Most dividend growers on this list show an amazing growth potential for both their stock price and their dividend. This is the type of holding that will do very well during bullish markets. Personally, I also appreciate the strong dividend increase each year. Dividend tech stocks are a better fit for inventors looking to boost both their portfolio value and their long-term dividend income. If you are looking for immediate income, this will be harder to find in this list. Founded in 1975 on the premise of offering the best computer operating system with a graphical user interface, Microsoft is now in 190 countries. The “More Personal Computing” segment includes Windows, Surface, and gaming division. The “Productivity and Business Process” includes the Office suites, Dynamics products, and cloud services along with their latest acquisition: LinkedIn. Finally, the “Intelligent Cloud” segment includes server products and cloud services (led by the fast-growing Azure) and enterprise services. Texas Instruments is the world’s largest analog chipmaker and a key supplier of embedded chips into a host of applications. For those who don’t know, analog chips are like translators; they convert real-world signals such as sound and temperature into digital signals that have the potential to be processed. The company is present in various segments with a strong focus on industrial and automotive sectors. The “other” segment now includes its famous calculators. Imagine a big business that employs 100 people and keeps growing. Each day, tons of information is collected about products, sales, employees, expenses, contracts, etc. This information is piling up in mountains of unreadable reports. It needs a solution to receive, integrate and digest this data. This is called an Enterprise Information Management (EIM) system. EIM helps managers make better decisions by organizing the information to access it rapidly, understand it and trust it. OTEX is a leader in the industry and Canada’s largest one. It helps over 100,000 customers to share, store, retrieve and analyze their company’s information. Cisco is the reference for switches and routers across the world. The way we transfer data throughout networks has been a pillar for many industries over the past decade. While 2/3 of CSCO revenue comes from switches and routers, the rest of CSCO sales come from faster-growing adjacent market segments such as wireless, security, collaboration, unified communications, and data center products. 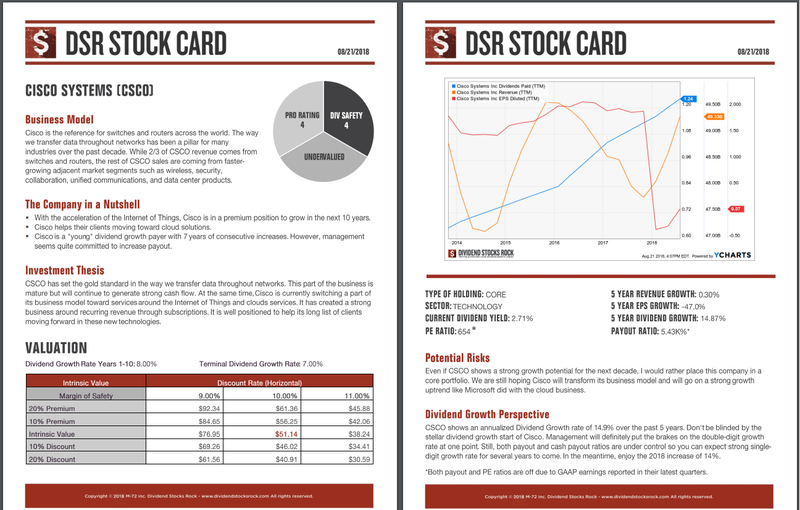 If you liked the tech dividend stocks list, but you are looking for additional sectors, you can register for our free newsletter and receive exclusive access to all our sector dividend stock lists. For each industry, we cover both U.S. and Canadian dividend stocks.